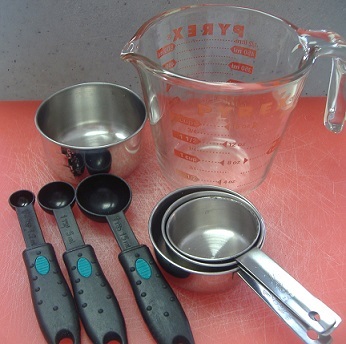 Measuring Tools and Mixing Bowls are "unsung heroes" in the kitchen. Ever taste food with too much salt or soda or cayenne pepper? That's the point. Measuring carefully and mixing properly involves three things: reading carefully, knowing measuring and mixing techniques and having the proper tools to perform. This information is provided to help ensure that your ingredients are measured properly and mixed as required. Actually there are a number of kinds of kitchen measuring utensils, but the basic or most common ones used are listed below with brief descriptions. You need at least four: 1/4 teaspoon, 1/2 teaspoon, 1 teaspoon and 1 tablespoon. Most "sets" have at least these. Some sets, and I recommend them, also have 1/8 teaspoon, 3/4 teaspoon and 1/2 tablespoon. If you can't find such a set, then supplement the basic set with a separate odd size set. There are also adjustable measuring spoons but I personally do not use them I've tried them. It's easier to use the standard spoons. For me, the adjustable spoons are more difficult to use when I'm in a hurry. Because measuring spoons (regardless of material) are fairly inexpensive, I recommend you have two sets. You probably know the reason. I use one set for dry ingredients and the other for liquid ingredients while I'm cooking because I do not like to wash and dry them every time between measuring different ingredients. What material is best? You have several choices: aluminum, plastic, stainless steel, copper and chrome-plated steel. Any of these are fine; they all work. I prefer stainless steel. Aluminum is too light weight. It bends and discolors. Plastic will not last as long as stainless steel. It can be scratched and bent. Copper and chrome-plated steel are beautiful but more money. I'll stick with stainless. 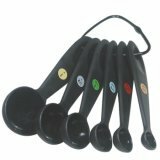 What has been said about measuring spoons holds true for dry measuring cups. You need at least four: 1/4 cup, 1/3 cup, 1/2 cup and 1 cup measures. Some sets may also include 1/8 cup, 2/3 cup and/or 3/4 cup. These measuring tools are usually made of either metal, glass or clear plastic with a pouring spout and a handle. The plastic ones are very good. There are "angled" plastic measuring cups on the market that are designed to make it easier to view the amount of liquid in the container, from the side or the top. They work well. Measuring the weight of ingredients is even more accurate than measuring by volume. A good balance scale is something you might want to consider. 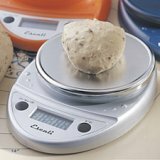 I use a scale at the restaurant and at home. There are manual and digital models on the market. I use these as measuring tools at the restaurant and at home. These scoops are important measuring tools for strict portion control. You should have at least a 1-quart, 1-1/2-quart, 2-1/2-quart, and 4-quart mixing bowl. Are you in need of several of these measuring tools? 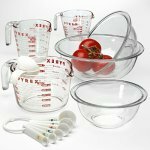 You may want to purchase a "set" such as the Pyrex set pictured here. You could save yourself some money by purchasing a set instead of several individual pieces. Oh, thank you for finding my website! Please “bookmark” the site so you are able to find the site again!